The nine members of the California Water Commission have been tasked with deciding how to award the $2.7 billion in Prop 1 funds slated to pay for the public benefits of water storage projects, and competition is pretty fierce. 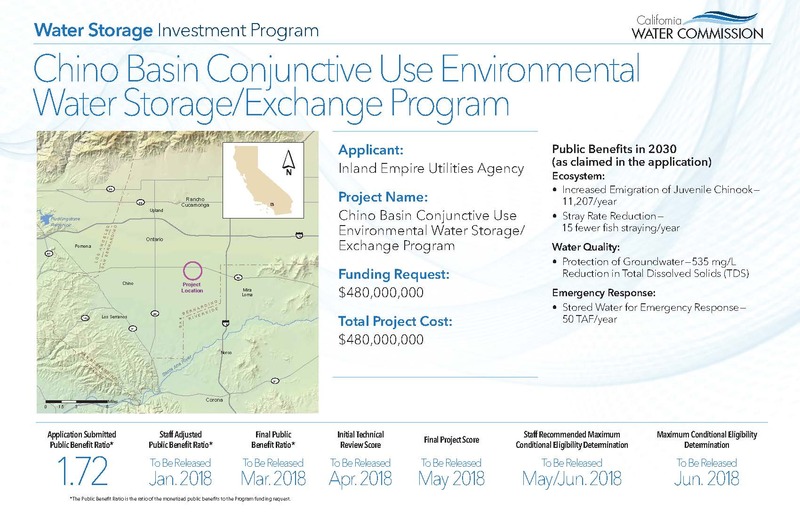 Eleven storage projects have filed applications for the Water Storage Investment Program, requesting roughly $5.7 billion in funding, or more than twice what is available. However, it is likely that as Commission staff review the applications, they will be adjusting the public benefit calculations, thereby reducing the amount of funding the projects would be eligible to receive. The method by which eligible projects will be awarded funding is a bit complex as a result of specific language legislators wrote into the proposition that set certain conditions for the funding of eligible projects. Funding can only be granted for water storage projects that improve the operation of the state water system, are cost effective, and provide a net improvement in ecosystem and water quality conditions. The statute further stipulates that the Commission can only provide funding for the public benefits provided by the projects; those benefits are specifically defined as ecosystem benefits, water quality, flood control, emergency response, and recreation. It is important to note that increasing water supply is not considered a public benefit that is eligible for funding under Prop 1. The statute sets a limit on the state’s cost share to a maximum of half of the total project costs, and of the amount funded, half of the amount must be for ecosystem improvements. The statue requires that the project must also provide measurable ecosystem improvements to the Delta or tributary and be consistent with the Wild and Scenic Rivers Act. At the December meeting of the California Water Commission, proponents of the eleven projects presented their projects to the commissioners, and the public had a chance to weigh in. Nevada Irrigation District’s Centennial Dam project and Semitropic’s Tulare Lake storage project generated the most opposition at the meeting with mild opposition expressed for Sites and Temperance Flat reservoirs. Contra Costa Water District’s Los Vaqueros expansion project, Santa Clara Valley Water District’s Pacheco Pass reservoir expansion project, Inland Empire Utility Agency’s Chino Basin project, and Regional San’s South Sacramento County project received the most favorable comments at the meeting. You can view the application information for all projects by clicking here, and the public comments received for all projects by clicking here. Here’s a brief summary of the projects as presented. The Chino Basin Conjunctive Use Water Storage and Exchange Program is a project that would utilize a multiple of local sources such as water from a contaminated groundwater basin, from wastewater treatment plants, and from new growth and use that to develop a water supply that can be stored and released on demand in a way that benefits Delta tributaries. The project would take these different sources of water, treat it, and inject it into the Chino Basin groundwater basin; when the water is needed, the water is removed from the groundwater basin and injected back into the local system, and in turn, DWR releases the water from Oroville Dam. The project provides a new water supply that would be guaranteed for the Delta of 15,000 acre-feet; in dry or critically dry years, that amount could be potentially significant for fish and move them away from jeopardy, project proponents say. The proposal also includes the ability to borrow up to 100,000 AF that could be used for the public benefits. 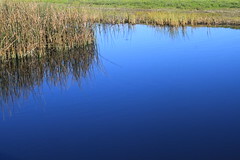 Other public benefits include improving water quality in the Chino Basin and emergency response water supply for Southern California through agreements with State Water Project contractors. The water treatment costs for this project would be significant as some of the water will require significant treatment to get it to a good enough to go into the ground. State funding would be used for capital costs for the project; operation and maintenance costs would be borne by the project partners. Local benefits of the project include more effective operation of the groundwater basin and the ability to address subsidence by injecting water in problematic areas. For more information, click here for a power point. Irvine Ranch Water District and the Rosedale-Rio Bravo Water Storage District have been partners in a water bank in Kern County for many years. This project would expand the size of the water bank by building a new turnout from the California Aqueduct with a 10 mile canal and three lift stations, as well as acquisition of 1500 acres of recharge basins. The project would have the ability to capture over 100,000 AF of water supplies. The project is located in the west portion of the Kern subunit of the Tulare Lake Basin, a critically overdrafted basin. This location allows access to three sources of supply: State Water Project, local Kern River supplies, and Central Valley Project supplies via the Friant-Kern Canal. This project would commit a percentage of the water supplies for Delta purposes which could be utilized to address a variety of challenges within the Delta. The water could be recovered when needed for ecosystem needs through trades of project proponent’s Table A water for groundwater withdrawal. The additional recharge ground within Kern also provides intermittent wetland habitat. Integrating groundwater banking projects with local and regional programs creates a multiplier effect on the benefit calculation, proponents say. 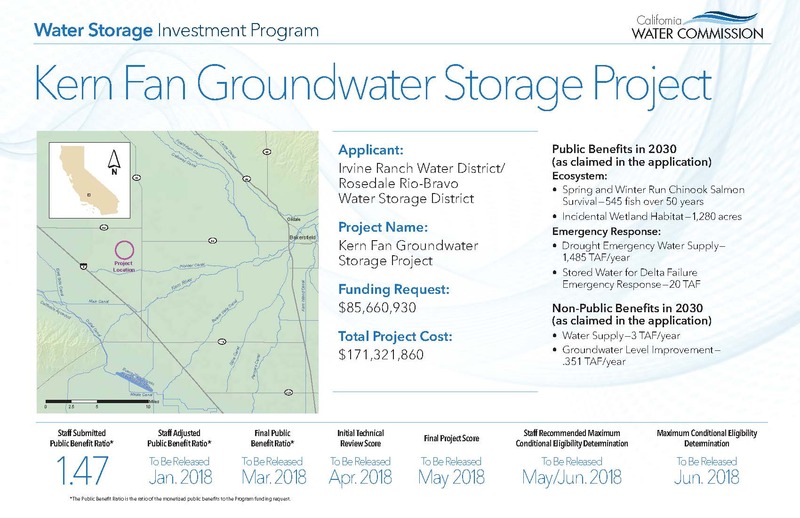 The project would also provide non-emergency supplies for Irvine Ranch Water District and other project partners during normal, dry, and critically dry water years. Sources of water include unallocated Article 21 water from the State Water Project, possibly Kern River floodwaters, and possibly water through the Central Valley Project. Timeline: Feasibility studies will be completed by 2019 with design and environmental compliance following through 2020. About 50% of the project would be online in 2023 with the remainder online by 2025. Click here to view a power point on this project. Los Vaqueros Reservoir is on off-stream surface storage project originally completed in 1998 that provides water quality benefits, drought supply, and emergency supply for the East Bay. The first phase of reservoir expansion was completed in 2012; Phase 2 expansion project would further raise the dam and expand the reservoir. Phase 2 would also provide water for the environment, increase water supply reliability, improve water quality, and enhance recreation. The project is a key component of the Bay Area Regional Reliability Effort, a collaborative effort among the 8 Bay Area water districts to improve drought response and overall reliability. During recent drought, the phase 1 expansion project provided critical drought emergency benefits to both the Contra Costa Water District and their regional partners in the East Bay. Los Vaqueros reservoir is the only CalFed surface storage project to have been permitted and constructed so far. The project was designed and is operated to be protective of the Delta ecosystem. 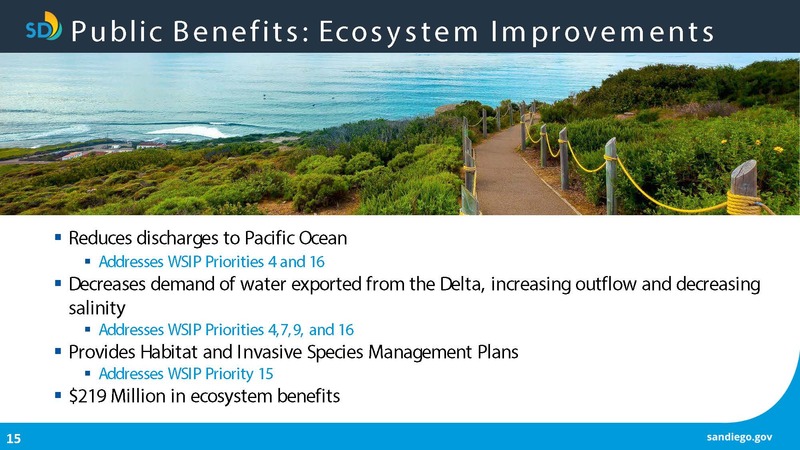 For public benefits, the project would significantly increase supplies to south of Delta wildlife refuges; improve operations to reduce entrainment to protect endangered Delta fisheries; and provide emergency supply in the event of catastrophic emergencies or drought. 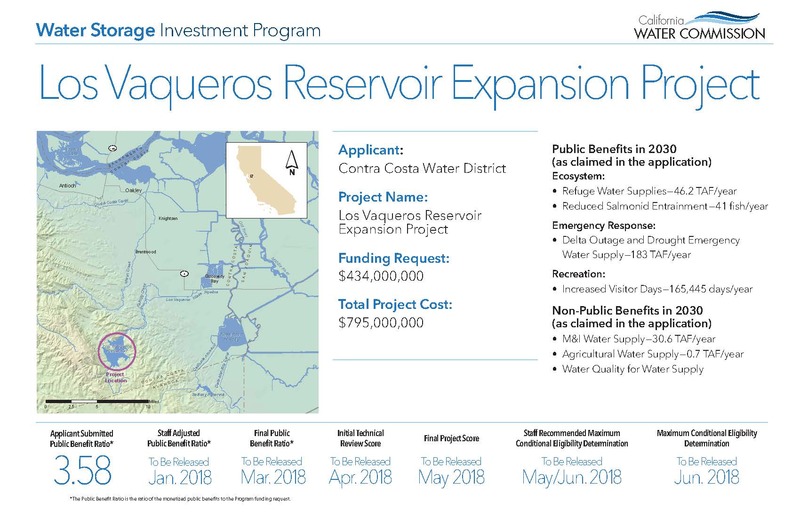 The project would enhance recreation offerings in the Los Vaqueros watershed, and provide support for some recreation activities that occur at south of Delta wildlife refuges. Non-public benefits include providing a drought supply for urban suppliers, improving normal water supply reliability, and helping to optimize how project proponent’s portfolio of water supplies are managed. The project would also provide water quality improvements and improve agricultural supplies, especially in dry years, as well as provide additional operational flexibility. 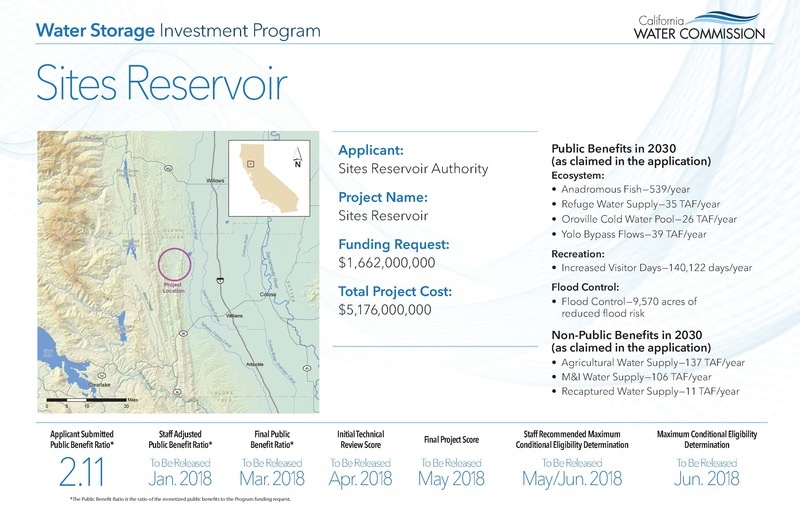 This project will utilize existing water rights and will not require any applications for new water rights; the water would be from a combination of normal allocations from State Water Project and Central Valley Project, as well as Delta surplus rights. They are working with Reclamation and project partners to determine if any modifications to water rights and other contractual agreements are needed. An important feature of the project is by constructing the Transfer-Bethany Pipeline to the California Aqueduct, all water can be delivered through CCWD’s own facilities without the need to use the state or federal pumps in the Delta. Timeline: They recently completed final environmental documents. They plan to start construction no later than 2022 and should see public benefits by 2024. Click here to view the power point for this project. The project is located on the north fork of Pacheco Creek, a tributary of the Pajaro River. 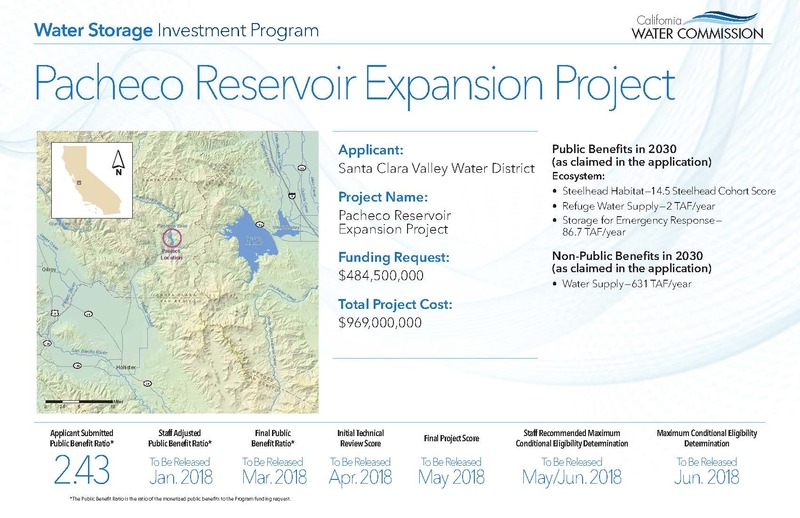 It is less than 5 miles of San Luis Reservoir and within 1 mile of the existing Pacheco Conduit, the major pipeline that conveys water from San Luis to the farms and businesses served by San Benito and Santa Clara Water Districts. This project will expand an existing 6,000 AF reservoir to 142,000 AF. 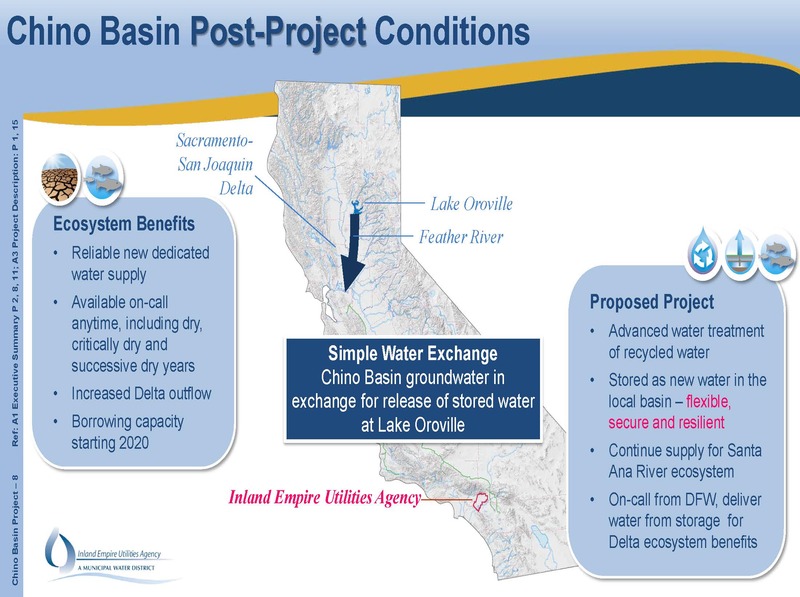 This would add 136,000 acre-feet of new storage south of the Delta, plus free up additional storage at San Luis Reservoir. 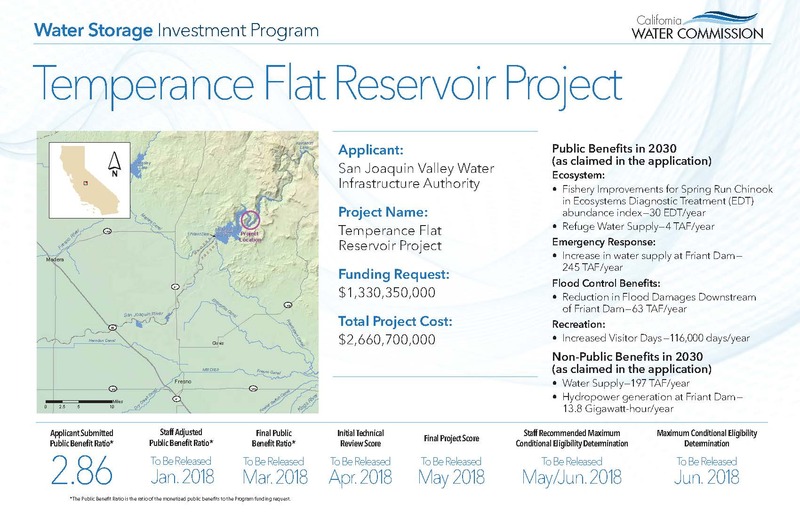 The project is uniquely positioned in close proximity to Central Valley Project facilities, State Water Project facilities, and other regional water facilities to yield ‘unparalleled systemwide operational flexibility,’ say project proponents. 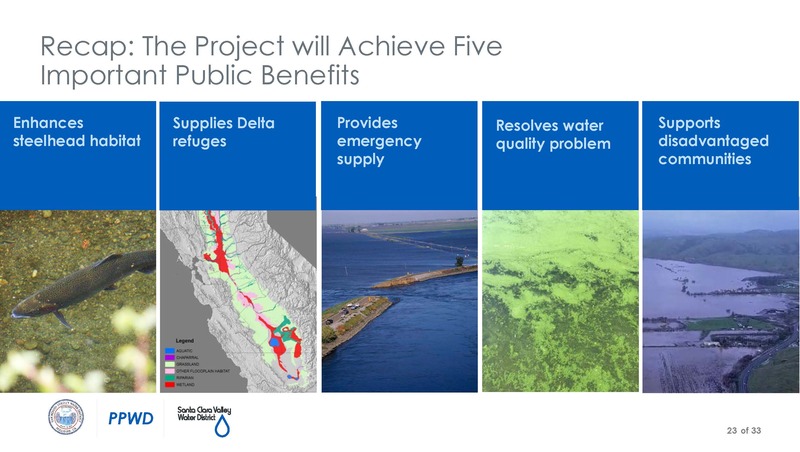 The public benefits of the project include providing water supplies for south of Delta refuges including a dedicated supply in below normal years; improving conditions on Pacheco Creek to help recover federally threatened steelhead; providing emergency water supplies for 2.1 million people; and reducing downstream flooding to disadvantaged communities living in floodplains of the Pajaro River. The project would also eliminate water quality impacts of the low-point at San Luis Reservoir by providing for the option to move the water from San Luis into the expanded reservoir earlier in the season. The project abuts Henry Coe State Park, which provides opportunities for trails and other benefits to coexist with the reservoir. The project is supported by a diverse group of environmentalists, eight south of Delta refuges, resource conservation districts, ag organizations, DSOD, organized labor, business groups, community groups, and water districts. Click here to view a power point for this project. The Pure Water project will construct a new pure water facility that will take wastewater currently being discharged to the ocean, treat to meet or exceed water quality standards, and then put the treated water into reservoirs to augment supply. Pure Water Phase 1 is comprised of several different projects, including pump stations, pipelines, and new treatment facilities to create the purified water. It will produce 30 MGD or over 33,000 AF every year for the City of San Diego. All of these facilities will be owned and operated by the City of San Diego. The project will utilize a new power supply capturing methane gas from the landfill and use that to power the reclamation facilities in the northern part of the city; this will reduce GHGs, helping the city to meet its climate action goals. The public benefits of the project include reducing wastewater discharges to the Pacific Ocean and decreasing demand on exports out of the Delta, proponents say. They will incorporate habitat invasive management plans as part of this project. 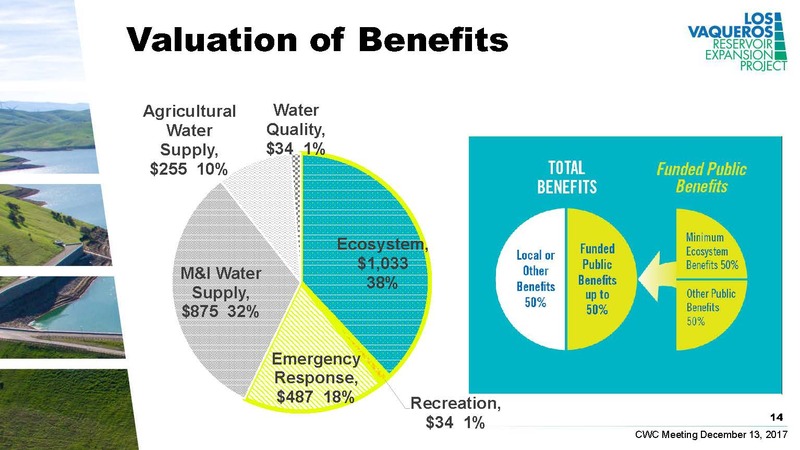 Other non-public benefits include water quality improvements and a local supply that reduces demands on the Delta. Timeline: Some of the facilities are at 90% design; the EIR is expected to be completed spring of 2018; Title 22 Engineering Report expected to be approved from the Division of Drinking Water also in mid 2018. Construction is anticipated to begin in October 2018 with project complete by 2021. 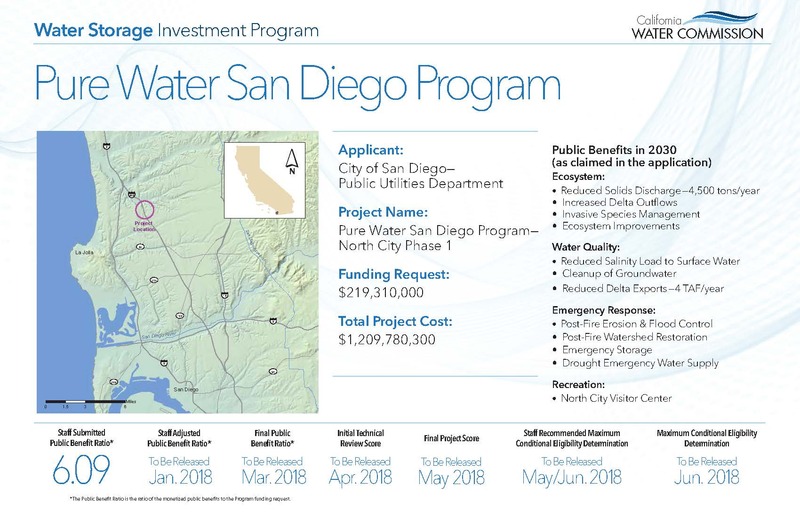 This project is supported by environmental groups, businesses, taxpayer advocates, and both Metropolitan Water District and San Diego County Water Authority. There was some discussion with commissioners about how this project would benefit the Delta. One Commissioner asked what know the Net Delta Export Value of a 33,000 AF reduction in SWP water demand would be; it was determined to be 4000 AF. The project proponents explained that they have $20 million set aside to partner with someone who has instream or in-Delta benefits. Comments: 1 video from mayor of San Diego in support of. Click here for a power point about this project. The Sites Reservoir Project is a 1.8 MAF off-stream reservoir near the Sacramento River. The advantage of an off-stream reservoir is that it doesn’t block migration of aquatic species, and supplies are more reliable because spilling of an off-stream reservoir is much less frequent. The project is locally led project and has significant statewide support from local community leaders, residents, state managers, legislators, and agencies from Bay Area to Southern California. The proponents say the project would deliver about 441,000 AF of water per year to the system to provide multiple benefits including drinking water and irrigation water; enhancing water quality; reducing downstream flood damage; providing recreational opportunities; integrating with renewables; and addressing climate change. The reservoir would utilize flows on the unregulated tributaries downstream of Shasta Reservoir, but proponents say only after environmental requirements have been met and only after all senior water rights obligations and demands have been met. Public benefits: The project will provide storage capacity for environmental benefits to benefit salmon, Delta smelt, and wildlife refuges. The state’s resource managers would control and direct the state’s share of the water stored in the reservoir. The project would create measurable improvements to the health of the Delta and the Sacramento River watershed; those benefits that can accrue for over a century, proponents noted. The project can integrate with the State Water Project and the Central Valley Project in drier years to release water from Sites Reservoir to satisfy downstream users, allowing that water to remain in the cold water pool in Shasta, Oroville, or Folsom. Releases from Sites Reservoir could potentially be used to increase floodplain inundation in the Yolo Bypass. Proponents noted that based on today’s requirements, some of the releases from Shasta could potentially be recaptured to provide other additional benefits. Sites Reservoir is the only Prop 1 project that can actively release water to help in response and recovery action in the Delta. The Sites Project Authority will be the owner and operator of the project. Thirty-three agencies are participating in the project; 28 have requested water supply benefits from the project, equivalent to 75% of the annualized storage the project can provide. Timeline: They are currently finishing environmental documents and working on permitting through 2019. By end of 2021, they expect to have acquired all permits, completed engineering, and have executed contracts with resource agencies who would manage their share of the Prop 1 benefits. Construction would begin in early 2022, partially operable in 2025, with full reservoir ability to operate in 2030. Public comment: 3 not in favor (Sierra Club, Friends of River, PCFFA: disputes environmental benefits), 3 in favor. Click here to view a power point about this project. 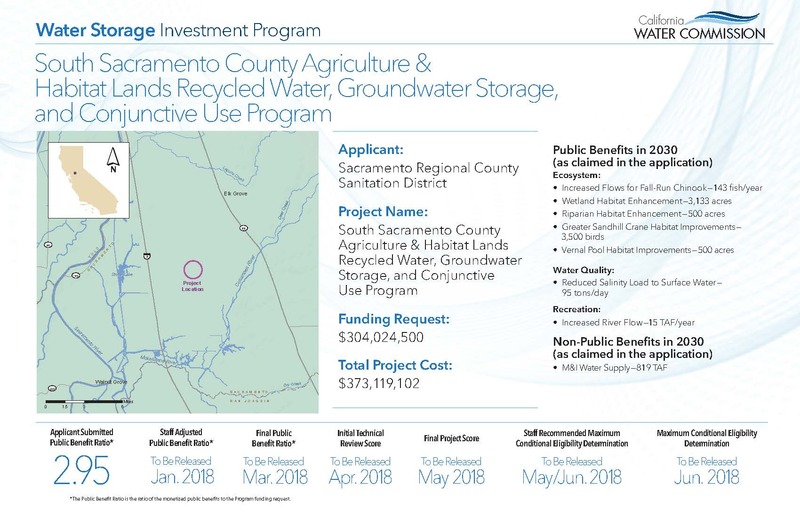 This project would provide 50,000 acre-feet per year of recycled water to Southern Sacramento County, irrigating up to 16,000 acres of agricultural and habitat conservation lands. The water for this project will be available once Regional San has completed the upgrades to their treatment plant in 2030, which will produce tertiary-treated recycled water. This project can provide a drought-proof supply of water for beneficial uses in the region. Public benefits of this project are as a result of improving groundwater levels in the area. The project would construct a 14-mile transmission pipeline to the southern Sacramento area, as well as distribution lines. The water delivered will be used to recharge the groundwater basin to remediate several cones of depression in the area due to groundwater pumping. The recycled water would be provided to ag customers in lieu of pumping groundwater and that will increase groundwater levels. The rising elevation of groundwater levels will help reconnect the aquifer to the Cosumnes River, which in turn will help restore riparian habitat and increase instream flows on the river, which is often dry in the summer months. The farmers who receive water will also implement wildlife friendly practices to benefit sandhill cranes and other sensitive species in the region. The project would help support habitat in the nearby Consumnes River preserve and Stone Lakes NWR. The project will implement a groundwater accounting framework that will integrate with the SGMA. They will enter into contracts with ag users and water suppliers, targeting delivery to the most ecologically important parcels, and develop an operations plan that focuses on the water year type and when water would be withdrawn. The project will also provide water quality benefits by reducing salt loading to Sacramento River by 95 tons per day. The project provides flexibility to regional water facilities, as well as statewide water supply benefits, proponents say. Currently, water supply is taken off the Sacramento and American rivers; with the establishment of a groundwater banking system, during those times of drought, water suppliers would be able to draw on water from the bank, allowing that surface water would be able to remain in the Sacramento River and be used for other purposes. Regional San has been working since 2009 with a variety and groups including farmers, environmental organizations, and GSAs and have garnered a lot of support for the project. Timeline: They have a completed feasibility report approved by USBR, a certified and final EIR and a 10% facility design. Next steps are formal design in 2019, online in 2023, which coincides with the time treatment plant facilities are completed. Public comment: 4 in favor. The Temperance Flat Reservoir would be a 665-foot dam on the San Joaquin River above the existing Friant Dam, creating a 1.3 MAF reservoir. The reservoir would be filled with San Joaquin River flood flows that exceed capacity of Millerton Lake management capacity and San Joaquin River Restoration Program (SJRRP) flows; south of Delta supplies such as allocations and acquired water; and regional water supplies from other watersheds. 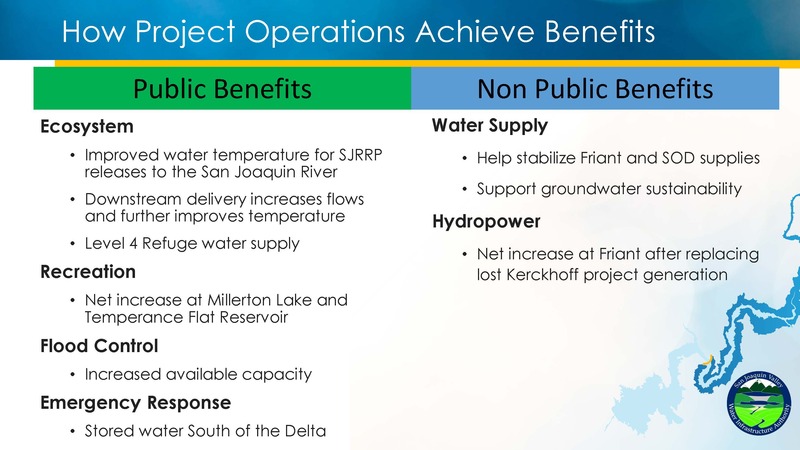 Public benefits include improved water temperature for SJRRP releases to the San Joaquin River, downstream delivery increases flows and further improves temperature; activation of flood plains, increased flood control capacity; supplies for wildlife refuges, and south of Delta emergency response. The location of the reservoir provides a south of Delta water response reservoir that would have available 250,000 acre-feet in the event of a Delta outage that can be conveyed down the Friant-Kern canal, the Madera Canal, or down the San Joaquin River to connect to the California Aqueduct, so the project could serve the San Joaquin Valley as well as Southern California. Using the same modeling as the SJRRP, proponents say the project would produce significant benefits to the salmon, anywhere from 231% to 3105% under different climate regimes. 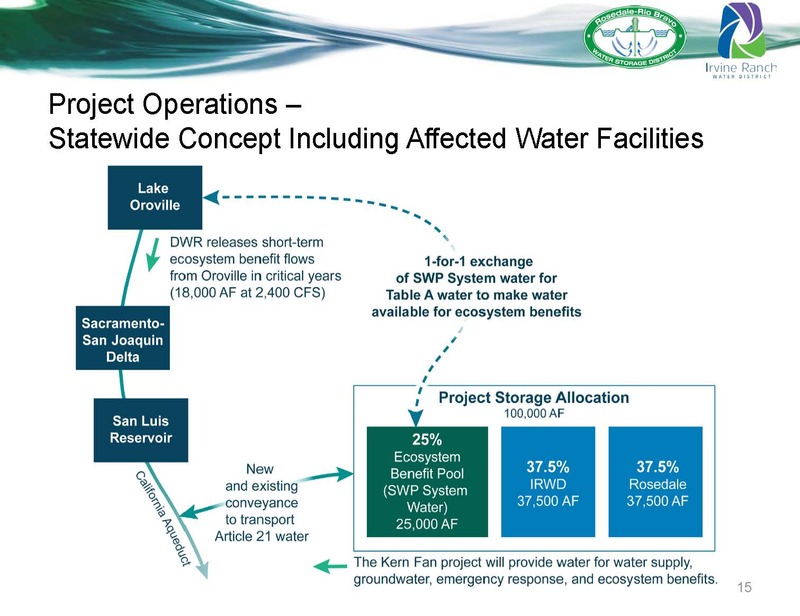 The Temperance Flat project would provide great flexibility to the water system by allowing South-of-Delta users to move stored water from San Luis Reservoir through exchanges to Temperance Flat with low risk of loss, and east side water users can improve coordinated management with groundwater and local supplies, proponents say. The ecosystem will benefit from the added flexibility by allowing refuges to store water in wet years for use in dry years and providing ability for the SJRRP to more flexibly manage releases, such as pulse flows and ramping to establish riparian habitat. Timeline: By 2021, the final environmental documents will be completed. Construction could begin as early as 2024, with partial operations producing public benefits in 2030 and full operation by 2033. The Semitropic Water Storage District is located in Kern County between I-5 and SR-99 in Tulare Lake basin. The District is 220,000 acres in total, of which 135,000 acres are irrigated agriculture; the District encompasses a large portion of Kern NWR and includes more than 5000 acres of managed wetlands. Semitropic receives water from the State Water Project through a contract with Kern County Water Agency and is located in both the state and federal water project’s place of use. The project would build a reservoir in a portion of the historic Tulare Lake bed 15-30,000 acre-feet in size, and would include conveyance to/from the California Aqueduct, as well as conveyance improvements to allow for water to be moved from the south fork of the Kings River to the Kettleman Reservoir and ultimately to the California Aqueduct and to Semitropic in Kern County. The project anticipates capturing a portion of the floodwaters available from Kings River system that project proponents say historically has exceeded the conveyance capacity of those within the Kings River service area to utilize; that water would be moved to Kern County via the California Aqueduct to help remediate groundwater overdraft. The project also involves amending an existing agreement with DWR for groundwater banking that would allow the Department to be able to store and recover water for any type of in-Delta ecosystem need. The project would provide the ability to capture Article 21 (essentially surplus State Water Project water) water that they would store on behalf of DWR that could be recovered for ecosystem needs in dry and critical years through an exchange within the system. 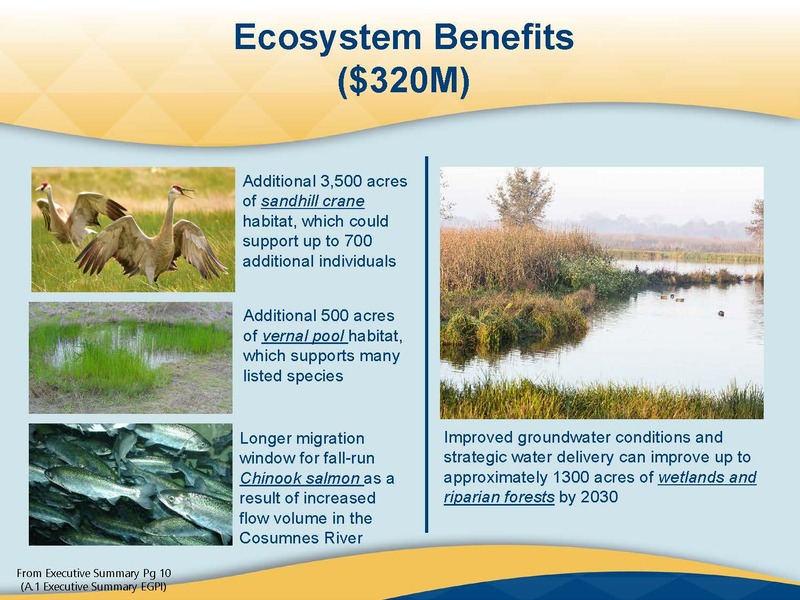 The public benefits of the project include ecosystem improvements in the Delta fisheries relative to the exchange, the ability to opportunistically rewater a portion of the historic Tulare Lake along the Pacific Flyway, improved flood management, increased recreational opportunities within the area, and emergency response tied to DWR banking contract. Non public benefits include improved water supply and operational flexibility for both the State Water Project and Semitropic; the opportunity to improve groundwater banking and conjunctive use, improve local and regional water supply reliability, and improve water quality in SWP system. Timeline: The environmental review and permitting process underway which is expected to be completed by mid 2019; design would also be completed by mid 2019 with the construction contract awarded later that year. The Willow Springs Water Bank is located in the Antelope Valley in Southern California near Lancaster and Palmdale in proximity to the California Aqueduct, the Los Angeles Aqueduct, and the AVEK West Feeder. The land has excellent percolation, good water quality, and is located in an adjudicated basin. The Water Bank is owned by CalPERS and has been in operation since 2007. Other partners in the project are the San Diego County Water Authority, Rosamond Community Services District, and Homer LLC; they are in discussion with other potential partners. The project is a conjunctive use project that anticipates operating conjunctively with San Luis Reservoir and Oroville Reservoir; through reoperation of those reservoirs, the project would capture spills that would otherwise flow to the ocean. The project would build conveyance between the project and the California Aqueduct, use percolation ponds to recharge the groundwater, and install a significant number of wells for extraction. 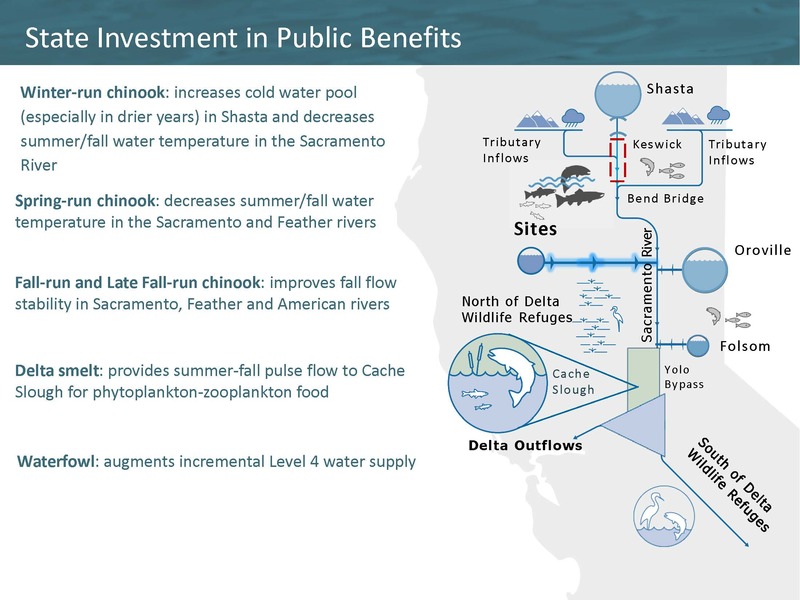 The public benefits would be primarily to fisheries through releases out of Oroville to increase flows in the Feather River and to provide emergency response to areas south of the Delta. The proponents explained that the project captures spills by taking water out of existing water out San Luis or Oroville, and move it into the groundwater bank in advance of a wet year, making that space available to capture more yield. This would effectively leverage existing reservoirs by moving water into groundwater storage, enabling the state to get more benefit from the large reservoirs it already has, proponents say. The project involves reoperating reservoirs and utilizing exchanges among contractors to effectively create stored water in Lake Oroville which could then be maintained there and used for pulse flows to save juvenile salmon on the Feather River. The facility has 640 acres of solar arrays located on some of the water banking land; they have found a compatible way to use solar panels with a groundwater bank. They are currently working on a study for the California Energy Commission for hydropower storage which involves studying the effect of shifting deliveries from the Edmonston Pumping Plant out the peak summer period into the spring and winter when there’s a surplus of renewable energy; in doing so, that would both reduce peak electric loads in the summer as well as increase renewables penetration for the state. Proponents note that the project diversifies state’s storage system as well as provides added benefit of energy components. As climate change gets worse, the project yield improves, they say. The project addresses some of critical needs and priorities on things like sustainability and GHG emissions. Schedule: The proponents are a public-private partnership, so they have already selected a design-build firm. Master plan for facility is done and the property has been acquired. The EIR was completed in 2006. Once they have a decision from the Commission, they will begin constructing the pipes and percolation ponds to build out the bank. Construction could begin as soon as summer 2018 with full operations by early 2020. Public comments: No public comments. The Nevada Irrigation District covers 287,000 acres, operating from Lincoln at 185 feet elevation up to 7000 feet in the Sierra Foothills. They provide irrigation water and treated water, hydropower, and recreation at 13 different recreation facilities in the Sierra. The Centennial project would construct a 110,000 acre-feet reservoir located between the existing Rollins and Combe reservoirs on the Bear River. The reservoir would operate on a series of water rights in the Bear River that were established by a state filing in 1927. The project would also entail relocating the Dog Bar Bridge, considered a safety hazard. The project would also expand NID’s raw water system to areas that have been part of the district since 1921 but have not been receiving service. NID’s facilities are intertwined with PG&E facilities; together they operate a combined system with PG&E making deliveries to PCWA through NID’s facilities, and sometimes both deliver to South Sutter. Public benefits: NID is asking for $12 million out of $324 million total project cost for recreation and environmental benefits. The public benefits include creation of open water habitat, and increased cold water pool for the stretch of Bear River between Combe and Camp Far West that has been identified by DFW as being ‘openly hostile’ to aquatic species because of the water temperature. The project would also help bald eagles and osprey populations in the area, and expand wetlands and shallow river habitat from 22 acres to 223 acres for yellow legged frog and other species. Recreation benefits include more trails, expanded RV and tent camping, and motorized and non-motorized boating. Additional benefits include more storage at the 1800 foot elevation which is important for regional water reliability, proponents say. The reservoir would create a fire break, inhibiting cross canyon fires and would be air operations compatible. NID’s system is a rain-driven system, relying on surface water storage and snowpack. Without snowpack, the district is at a distinct disadvantage, say proponents; under climate change, the district must look for additional storage opportunities and the Centennial Reservoir is that project for them. Timeline: They anticipate starting construction in 2021, project operational by 2023, and public benefits starting immediately. NID will be the sole owner and sole funder of the project. California Water Commission staff continue to review the applications, and working to synthesize information from the multiple parties to formulate the overall public benefit ratio review. Executive Officer Joe Yun noted that it’s taking more time than initially anticipated. Mr. Yun indicated he would be looking at how the schedule can be modified to allow adequate time for the appeals process; those schedule modifications will be discussed at the January Commission meeting. It is also anticipated that at the January meeting, Commission staff will be presenting their public benefits calculations. After appeals are completed, the Commission will determine the final public benefit ratios, finalize component scores and rank projects with the decision on funding expected late spring or early summer of 2018. 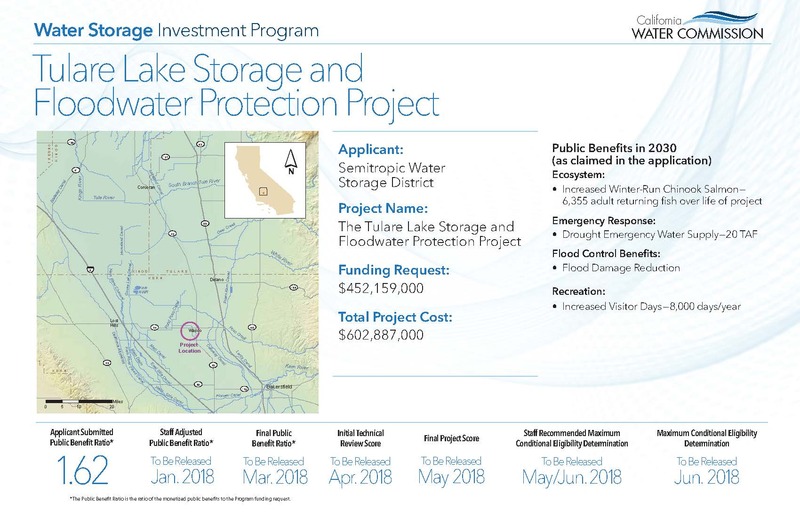 You can view the submitted applications for all the projects at the California Water Commission’s portal by clicking here. You can view all correspondence received on the projects by clicking here. For more information on the Water Storage Investment Program, click here. For the December agenda, meeting materials, and webcast, click here.